ROOTS & BRANCHES CONSERVANCY - Sound Summit & Beyond! Digging Deep & Branching Out! Help us further our conservation work on Mount Tam with Sound Summit and extend our reach with new arts and culture programming. Roots & Branches Conservancy is a San Francisco Bay Area-based nonprofit organization dedicated to the conservation of natural resources, both physical and cultural. The broad arc of those efforts ranges from regional environmental and educational projects to the preservation and evolution of artistic and cultural traditions – musical, visual, narrative, social, political, and beyond. Wherever possible, we aim to create intersections between the environment, education, and the arts to their mutual benefit. 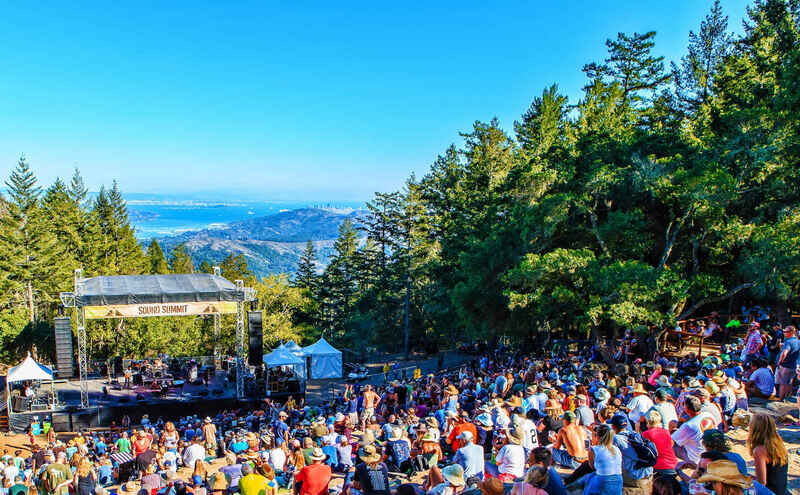 Via Sound Summit, our annual music and arts festival high atop Mount Tam, we've raised $200,000 to date for Mount Tamalpais State Park, allocated to projects with tangible impact in fire prevention, water conservation, emergency equipment, and visitor services. We want to continue these trends in the coming year, both in staging another festive and memorable day of music on the mountain and in conjuring up some new creative adventures we've been brewing for awhile. Among them . . .
• A curated series celebrating the deep roots and fruitful branches of Bay Area arts and culture, pairing an eclectic array of artists and cultural figures in engaging programs of performance, collaboration, and inspired conversation, each to be filmed as an ongoing educational resource and archive. • An annual multi-media "happening" which will combine regional music, dance, photography, film, spoken word, visual and performance art, and more in a variety of unique settings. Our interests lie in producing resonant community experiences in our events, providing educational components in our programming, and making meaningful contributions to worthy beneficiaries. Supporting, preserving, and evolving regional arts, culture, education, and the environment is what we're all about. And we like the idea that good deed doing can be as creative as it is productive. We hope you share our passions and are game to lend a hand to our endeavors, both existing and upcoming. If you've enjoyed Sound Summit, whether this year or in years past, and believe in what we're doing, we ask that you consider making a tax-deductible year-end contribution of any amount to help us start 2019 on firm footing and create the opportunity for Roots & Branches to literally branch out and reach its broader potential. Thanks for your support! Keep the spirit of live music and love of the mountain alive and thriving! Music in a beautiful place played to help fund Mt Tam. How much better does it get? Great music on Mt. Tam is worth every last penny! Thanks for your hard work for Mount Tam, and for the amazing Sound Summit! Such a beautiful event and Mountain! Because Michael Nash, who runs this organization, is amazing and generous and we want to support his work in any small way we can. Thanks Chris and Paul for another fabulous Sound Summit!! Looking forward to peaking on Mt. Tam at Sound Summit 2017. Good for the soul, good for the mountain. Shout out to Mike Nash for all he does. Mark and I had a great time last year and looking forward to the event this year. Thank you for putting this show on! Mt. Tam SS if best community event to bring friends and family together for music, fun and reunion. Happy to be able to support Mt. Tam conservation.